Amphibious Travel Lift Has Wide Application Reasonable Design Factory Price Fleixble Move Safe Operation! Amphibious travel lift is great tool for reducing failure rate, avoiding accident, increasing efficiency and improving working condition. It can be used for lifting boat from water, putting boat into water, and can be applied for transporting and repairing boat on the land. The material is durable, it is anti-water and anti-corrosion. Thus this kind of gantry crane can be used both in the water and on the land. Ellsen Group, a famous and professional travel lift supplier in China, produces reliable boat hoists with affordable price! 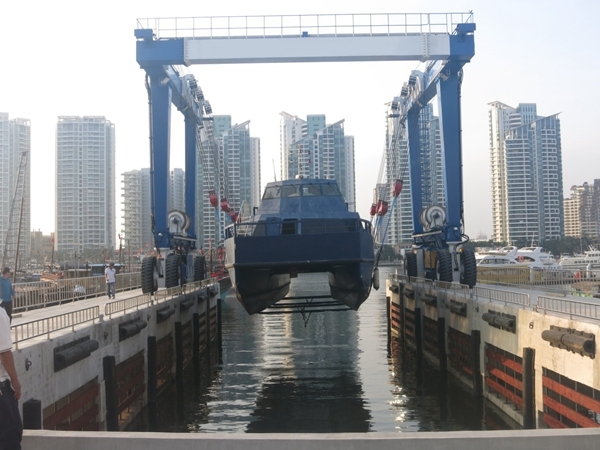 Ellsen travel lifts include port used small travel lift boat crane, travel lift for water sport meetings, aquatic clubs, voyages, safe driving steady travel lift, remote control travel lift, cabin control travel lift. All these cranes are designed and produced according to national standards and international requirements. For any practical needs, customers can provide specifications to Ellsen! Ellsen has customized service for the most suitable travel lift! Travel lift is also called mobile boat hoist. It is great choice for lifting vessels from 15 tons to 1200 tons. This special gantry crane has strong versatility in different working conditions. It has high safety level for light and heavy lifting duty. 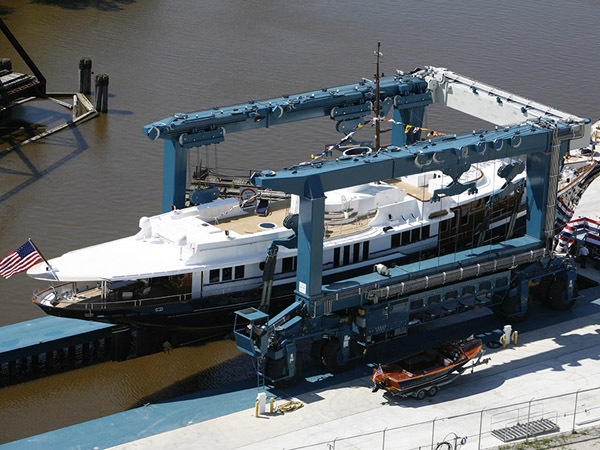 To lift yachts with different docking plans, customers don’t worry about the crane performance and safety. It is important for operators to take good check of yachts running gear and stabilizers before lifting. 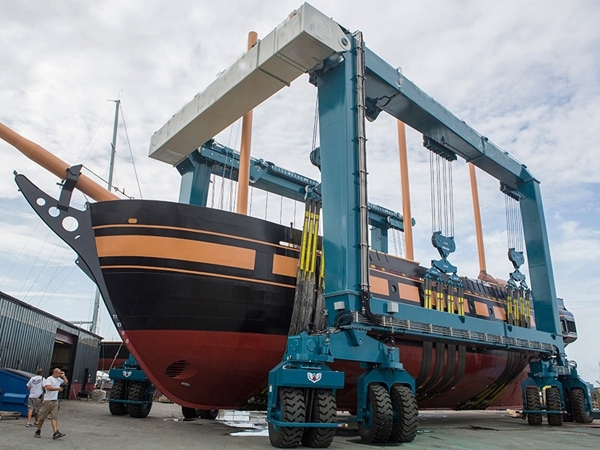 Ellsen marine travel lift is a cost-effective lifting crane. 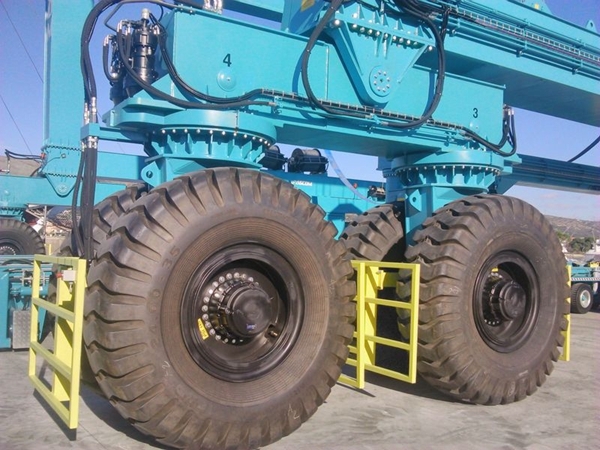 It has strong lifting capacity from 15 tons to 1200 tons. 8-32 wheel configurations are designed for optimum maneuvering and stability. For super yachts, just choose Ellsen heavy tugs. 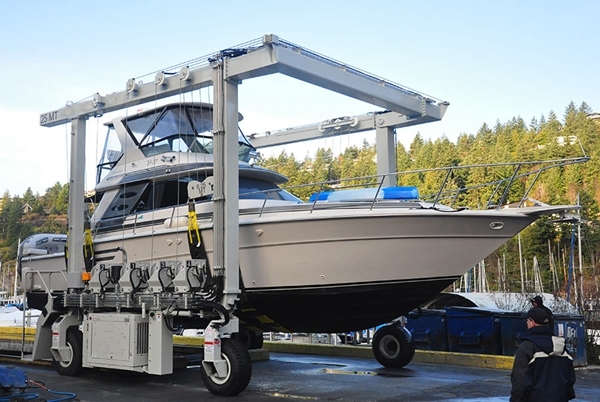 Ellsen boat lift crane allows optimized sling positioning to avoid appendages and stabilizers. For light lifting and transporting work, Ellsen boat lift hoist is also ideal for the needs of commercial yards. What is structure of straddle travel lift? This marine hoist consists of the travelling system, steering system, main steel frame, lifting system, power unit, pump station, hydraulic transaction system and electrical control system. There are different ways a boat hoist will raise a boat from the water. Some use chains or cable winched from above, whether from a superstructure that’s part of the hoist or from the ceiling of a boathouse. Others use worm gears inside heavy-duty rails. Some employ a set of vertical posts that guide the hoist, others use a single rail. What are characters of all-wheel steering travel lift? It is designed according to the user requirements and working condition. The crane has various steering modes, they are fast and accurate. Designed with auxiliary supporting cylinder, it can increase the life span of the tyres. 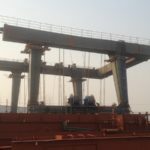 The top beam and the cross beam is connected in rigidity and hinge structure. It allows to work on levels with even opposite slopes. 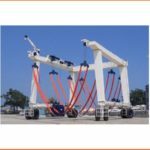 They are designed with fixed and movable lifting point on the top beam, the lifting point distance is adjustable, which can suit for hauling yachts in various lengths. Hydraulic system is used for travelling, steering and lifting, it is stable and steadily. Remote controller ensures a good sight view and easy operation. 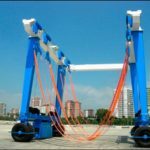 Amphibious boat hoist has comprehensive safety protection system. This can reduce failure rate, avoid accident, increase efficiency and improve working condition. It is important for customers to choose a good travel lift crane factory. Strong ship travel lift factory means qualified products, nice design, good price and great after-sale service. 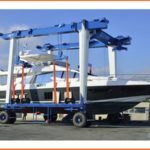 For crane itself, good hoist travel lifts factory chooses durable steel to produce the boat lift. For crane design, travel lift factory has professional engineers to complete the work well. For after-sale service, strong boat lift company always provides packaged service to make customers satisfied. Ellsen is such a professional boat hoist supplier. 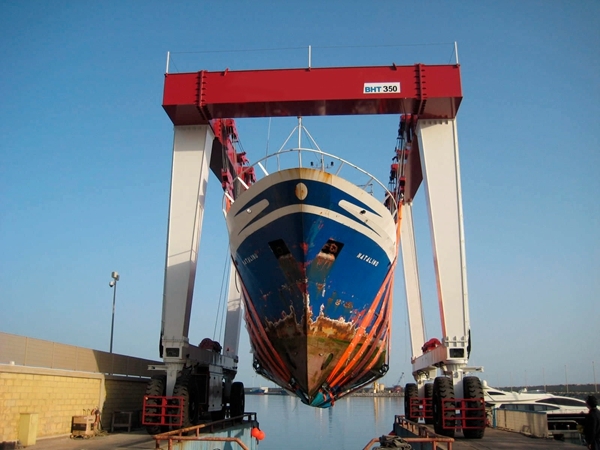 Ellsen provides types of boat lifts for sale, such as shipyard travel lift, construction boat lift, vessel travel lift, rubber tyre boat hoist. 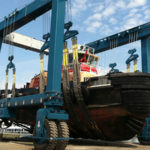 Ellsen designs and produces cranes according to the boat size, such as heavy duty travel lift and light duty boat lift. Boat hoist wheel plays an important part of crane performance. It is related to the crane stable move and flexible steering. Ellsen pays attention to travel lift parts and provides top quality boat lift wheels. Ellsen boat hoist wheel can service lifting work well. First, Ellsen boat lift tires is made of durable material. The tires are wear-resisting, and can service for long time. Second, Ellsen boat lift wheels can stand heavier lifting tons. This can increase working efficiency, reduce time and energy and improve working condition. Third, Ellsen sales boat travel hoist with affordable price. 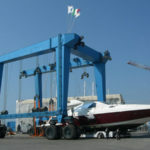 Because Ellsen has factory and provides marine boat lifts with competitive price. There is no medium-factory for extra expense. As the demand on your travel lift increases, it is important to address any lingering maintenance issues. 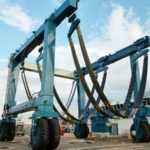 A critical and overlooked aspect of travel lift is the condition of the synthetics slings, called boat slings or marine slings. Sling is an essential part of travel lift crane. Before the increased demands begin to take a toll on your equipment, consider when was the last time you replaced your boat lift slings? First is overall condition. Slings can be damaged by cutting, pinching, overloading, etc. Slings should be inspected by a qualified operator prior to each use. Old and worn out slings could result in sling failure, making it all the more important for a travel lift operator to be able to identify when a sling needs to be replaced. Second is cuts. Overloading your slings beyond their lift capacity can often lead to cuts or fraying. If you are taking the necessary precautions and inspecting your sling before each use, then any cuts or fraying of the sling should be easily identifiable. However, if overlooked, any cuts or fraying can severely reduce lifting capacity and eventually lead to the breaking of a sling. Third is padding. Unless your slings have been properly padded, the sharp edges of a boat can cause a sling to cut and eventually break. Proper use and placement of keel pads and chine pads can extend the life of your boat slings and provide better protection to your vessel. Nylon or Polyester? Are your marine slings constructed of Nylon or Polyester? 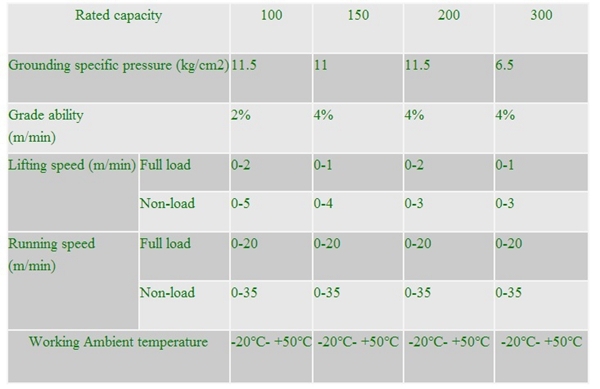 Keep in mind that polyester is the better choice for boat slings as polyester exhibits a reduced stretch factor as compared to Nylon – plus Polyester retains its full capacity when saturated whereas Nylon can lose roughly 10% of capacity when saturated. Regardless of their current condition, your boat lift slings need to be replaced regularly. 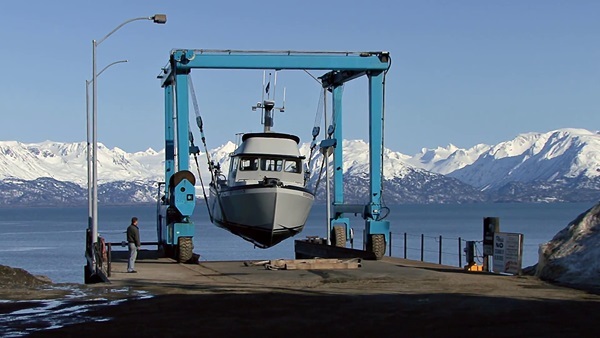 As you prepare your travel lift for haul out season, keep in mind Ellsen Hoists can provide a full inspection and safety service, as well as supply or source any travel lift parts, including marine travel lift slings. If you need help during the busy season, pls send quotation to sales@ellsentravellift.com, we will contact with u asap.